1. Producing a flat or plane surface which may be in a horizontal, a vertical or an angular plane. Working Principle: The job is rigidly fixed on the machine table. The single point cutting tool held properly in the tool post is mounted on a reciprocating ram. The reciprocating motion of the ram is obtained by a quick return motion mechanism. As the ram reciprocates, the tool cuts the material during its forward stroke. During return, there is no cutting action and this stroke is called the idle stroke. The forward and return strokes constitute one operating cycle of the shaper. 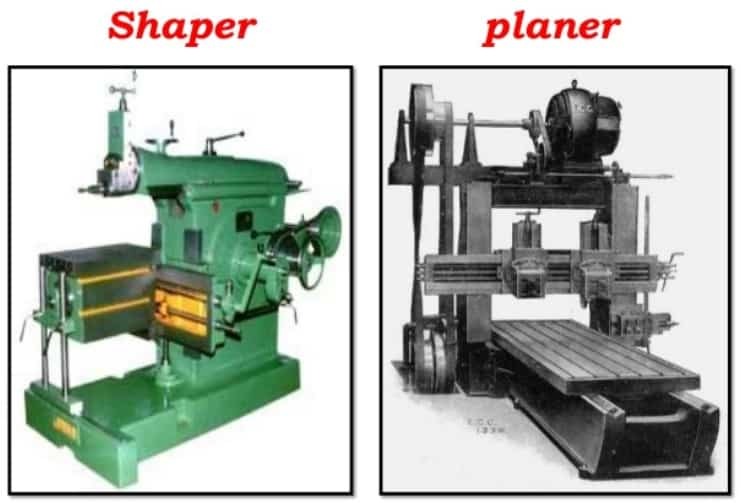 Introduction: The planer is a machine tool designed to produce plane and flat surface on a workpiece which is too large or too heavy. The workpiece is securely fixed on a table called platen, and it reciprocates horizontally against a single edged cutting tool. The surface machined may be horizontal, vertical or at an angle. 1. Planing flat horizontal, vertical and curved surfaces. 2. Planing at an angle and machining dovetails. 3. Planing slots and grooves. stroke of the work table. supported during cutting. Less accuracy due to the over hanging of the ram. 4. Suitable for machining small work pieces. Suitable for machining large work pieces. 5. Only light cuts can be applied. Heavy cuts can be applied. machining takes longer time. Vertical and side tool heads can be used at a time. So machining is quicker. 9. Tools are smaller in size. They are larger in size. 10. Shapers are lighter and smaller. Planers are heavier and larger.